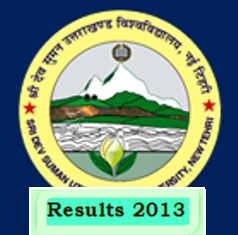 Sridev Suman University BA 1st Year Private Back Paper Exams 2013 Results declared: -Sridev Suman Uttarakhand University is the newly University of Uttarakhand Garhwal Region. It is started from last year and also conducted the BA, MA, B.Com and M.Com 1st Year Private Examination instead of HNB Garhwal University. Its head quarter is situated in the Badshahithol Tehri Garhwal. So let come to the main point about Back Paper examination results. So as of the now the Sridev Suman University has declared the results of BA (Bachelor of Arts) 1st Year Private Back Paper examination.